Overview: Meet the most-feared bounty hunter in the wild, wild west — Jonah Hex. A veteran of the Confederate Army, Hex travels the west looking for any opportunity to make money by bringing in a wanted man. The scars on his face are just one mystery surrounding Hex, as are his origins. Truth is, you are better off not knowing his story (yet), and you might live longer if you just stay out of his way. The stories in this volume are generally one-and-done, with little continuity from issue to issue. In the latter half of the Weird Western Tales run, we meet Quentin Turnbull, a wealthy Virginia landowner that is determined to see Hex hang for his crimes. This is revisited several times before Hex is finally brought to trial for treason due to his actions during the Civil War. Turnbull blames Hex for the death of his son during the war, but it is finally revealed that Hex was the victim of circumstance. Hex manages to escape, and Turnbull’s rage leads to his own demise. The book concludes with a run of stories featuring Outlaw, who was the star of All-Star Western before Jonah Hex took over. Now there are actually two Outlaws in this run. For issues #2 to #5, the Outlaw is Rick Wilson, a young man who wants to follow his father’s career path as a Texas Ranger, but is blocked by his parent. Angry, he rages against his father, becoming an outlaw on the run from the law. For issues #6 to #8, the Outlaw in question is Billy the Kid. No explanation is given for the change. Why should these stories be Showcased? : Jonah Hex has become DC’s most recognizable western character. He’s been a regular face in comics most months since his debut in 1972. He’s been featured in various DC animated features and was the star of his own big screen motion picture in 2010. (Yes, it may have been a dud of a film, but it still put a DC character on the big screen.) So, from a historical look, yes this should absolutely be showcased. Given the art talents collected in this volume (Dezuñiga and Garcia-Lopez), again, this absolutely should be showcased. I also believe that westerns, in general, are a genre that looks better in black & white. The only downside is that many of these stories read as very generic. For many of the stories, you could easily substitute Jonah Hex with another DC western character (Outlaw, Bat Lash, etc.) and still tell the exact same tale. My hope is that in Showcase Presents Jonah Hex Vol. 2, we get stories that are more dependent on Jonah Hex being the focus of the story and not just a feature in the story. If you like this volume, try: All Star Western, which was part of the New 52 launch from DC Comics. In the ramp-up to the 2011 reboot, DC promised a diversity of titles and genres, and this was their entry into western comics. This new title is written by Jimmy Palmiotti and Justin Gray, the scribes of the prior five-plus-year run of Jonah Hex from 2006-2011. 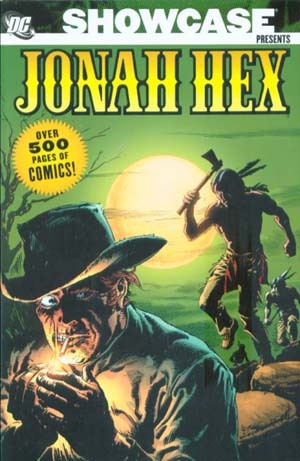 Jonah Hex remains the star of this book, but the title featured backup stories of other DC western characters like Bat Lash, Tomahawk, and El Diablo. What makes the title interesting was setting the book firmly in the past of the DC Universe, and not just in a generic past. For example, early in the title, Hex’s travels took him to Gotham City of the 1870s, meeting Amadeus Arkham, years before his home became a famous asylum. In early 2013, the book did a 180-degree turn. The backup stories were removed with issue #21, and the Jonah Hex story took over the entire book. At the same time, Hex was brought into the present and encountered heroes such as Booster Gold, Batwing, Batman, and Superman. Personally, I find Jonah Hex as a bounty hunter in the old west much more interesting than Jonah Hex as a stranger in a strange land. This entry was posted in DC Showcase Presents, Jonah Hex and tagged John Albano, Jonah Hex, Jose Luis Garcia-Lopez, Michael Fleisher, Tony DeZuniga. Bookmark the permalink. Pingback: Showcase Presents Jonah Hex Vol. 1 | Worst. Comic. Podcast. EVER! Pingback: Throwback Thursday – Showcase Presents Jonah Hex Vol. 1 – WORST. COMIC. PODCAST. EVER!